Temporary storage for your short term storage needs. Advantage Moving and Storage offers the primer short term storage facilities for your belongings. With over thirty years of storage experience, serving Chicago and surrounding areas our team has the storage solution for you. At Advantage Moving and Storage we have worked with numerous businesses, families and individuals providing us with the tools and experience to take care of your belongings. 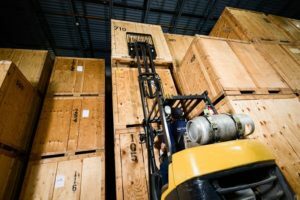 In order to provide our customers with the very best short term storage we have designed industry leading facilities paired with an expert staff of storage specialists and customizable storage plans. Advantage Moving and Storage is dedicated to providing its customers with industry leading storage solutions which is why all off our storage facilities were designed to protect your belongings. All of our facilities are climate controlled, protected from moisture and are furnished with cutting edge surveillance technology. At Advantage Moving and Storage all of our storage facilities are also monitored twenty-four seven to ensure that your prized possessions are safe and secure just how you left them. In addition to our top rated facilities Advantage moving and storage also has comprehensive storage services. As a full service company Advantage Moving and Storage offers a variety of plans and services specific to your storage needs. At Advantage we store everything from household goods, electronic equipment, office furniture, documents, hotel furniture to machinery and much more. We also provide numerous different sizes of storage units based on you and your belongings. Rest assured no matter what your storage needs are we have a storage solutions for you so sit back and relax while we keep your belongings safe and secure. In order to provide you with the best service one of our professional storage specialists will work with you to identify which services fit your specific needs and budget. At Advantage Moving and Storage our storage specialist are available twenty-four seven for any of your questions or concerns. For more information about Advantage Moving and Storage’s short term storage solutions or to request a free quote contact us today.